Chronic kidney disease (CKD) has become a global public health problem, and its prevalence and mortality rate are increasing significantly. One of the factors associated with the growth of mortality rate in patients with CKD is dyslipidemia which is actively involved in the pathogenesis of cardiovascular disease (leading cause of death in CKD) and causes deterioration of renal function. Therefore, management aims to bring low density lipoprotein cholesterol (LDL-C) to a value < 100 mg/dL. The National Kidney Foundation Kidney Disease Outcomes Quality Initiative guidelines recommend hydroxymethyl glutaryl coenzyme A reductase inhibitors (HMG-CoA INHB) also called statins as first-line drugs to achieve this target of LDL-C than 100 mg/dL. 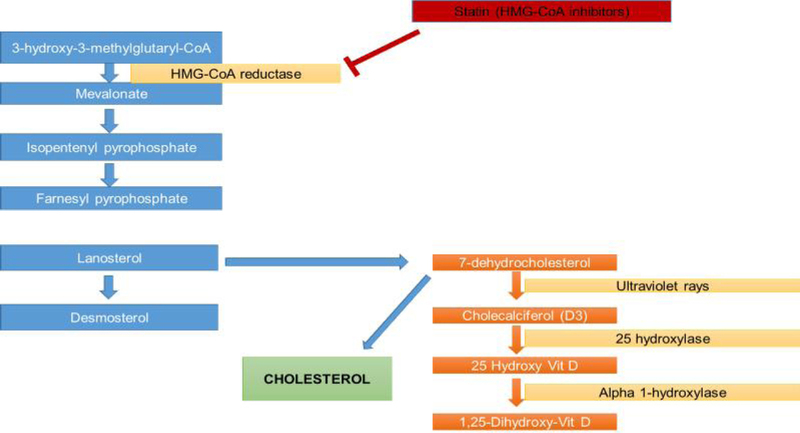 HMG-CoA INHB acts in the liver by inhibiting step of HMG-CoA to mevalonic acid, which restricts whole cholesterol synthesis cascade [Figure 1] and hence decreases the production of LDL-C. Due to their effectiveness and safety, these drugs are used as a first choice for the reduction of LDL. However, these features do not preclude patients from harm related to the use of these drugs such as myotoxicity or hepatotoxicity which are the most common adverse effects of statins although it is reported to have only a low chance to develop. Figure 1: Possible relationship between statin use and the concentration of Vitamin D.
Evidence suggests that the use of statins not only produces myotoxicity and hepatotoxicity, but that in turn could cause a deficiency of other cholesterol-dependent substances before the inhibition of cholesterol inhibition. 7-dehydrocholesterol is a prohormone which is a precursor molecule of cholesterol and pre-Vitamin D3 [Figure 1]. This compound is deposited in the dermis and once skin comes in contact with ultraviolet rays generates cholecalciferol (D3). As described in Figure 1, cholesterol metabolism and vitamin D both share the same metabolic pathway. Therefore, it is possible that there may be a high frequency of Vitamin D deficiency in patients with CKD who use statins for the treatment of dyslipidemia since inhibiting the production of cholesterol in the liver will also reduce the production of 7-dehydrocholesterol. This phenomenon would lead to a low Vitamin D concentration in the body. This situation could worsen the condition of these patients since there is also decreased activity of the 1-alpha-hydroxylase necessary for the activation of the Vitamin D which takes place in the proximal tubule. However, there is scarcity of research evidence that shows a causal association between the use of statins and low levels of Vitamin D. Therefore, this letter is addressed to generate new research direction based on the question whether there is an association between the decline in the levels of Vitamin D and the use of statins in patients with CKD, as this would be a relationship that could redirect the treatment of dyslipidemia in this particular patient population. Tsimihodimos V, Mitrogianni Z, Elisaf M. Dyslipidemia associated with chronic kidney disease. Open Cardiovasc Med J 2011;5:41-8. Tsimihodimos V, Dounousi E, Siamopoulos KC. Dyslipidemia in chronic kidney disease: An approach to pathogenesis and treatment. Am J Nephrol 2008;28:958-73. Kasiske B, Cosio FG, Beto J, et al. K/DOQI clinical practice guidelines for managing dyslipidemias in chronic kidney disease. Am J Kidney Dis 2003;41(4 Suppl 3):S11-S21. Reddi AS. Chronic Kidney Disease. Absolute Nephrology Review. Switzerland: Springer International publishing; 2016. p. 195-230. Baggerly CA, Cuomo RE, French CB, et al. Sunlight and vitamin D: Necessary for public health. J Am Coll Nutr 2015;34:359-65.